I realize that Thanksgiving is probably a foodie's dream come true and that maybe a special Thanksgiving recipe might have been expected. Well, sorry to burst your bubble, but while I am usually the one in the kitchen I always find myself sitting to eat at the table as well. Even though I was able to find a little time to help cook the big dinner (gravy, mashed potatoes, and a side dish of kale), I am still so full of turkey and stuffing to even think about cooking. So, hope everyone had a great Thanksgiving! There will be a recipe next week if I can command enough energy to stand up! Preheat oven to 400F. In a large oven proof saucepan, combine 2 tbsp olive oil with turkey necks and bones. Roast for 30 minutes. While you are roasting, bring a 3 quarts of water to a boil in a large pot. Also, break the carrots and celery in half with your hands and cut the onion into quarters. When the roasting is done, remove from the oven and place on a medium flame on the stove. Add the remaining olive oil and the vegetables and stir until they begin to brown (about three minutes). Add the thyme. Ladle the boiling water over the turkey until you have enough liquid to cover. Raise the heat to maintain a strong simmer. Simmer for 25 minutes. Kill the heat, cover and let the stock cool down to room temperature before straining. Bring a pot of water (and a pinch of salt) to a boil. Peel and cut up the sweet potato and add to the boiling water. Cook until tender and pass through a potato ricer. Stir in heavy cream and melted butter until smooth. Season with salt and pepper. 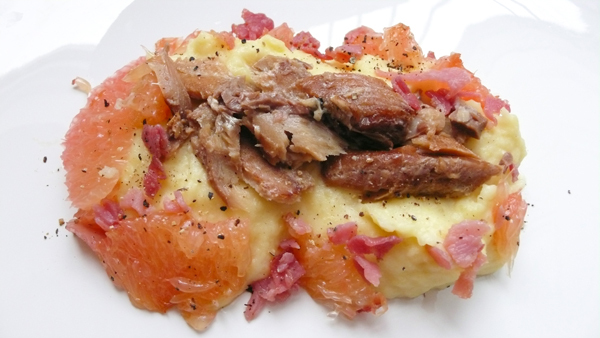 Dress with prosciutto, grapefruit sections and herring. Serves four. I've had the flu all this week and the last thing on my mind has been cooking. Aside from sleeping, I haven't really done much else, let alone eat. Every time I would work up enough energy to get something to eat, nothing would appeal to me. Last night I was feeling good enough to go out and grab some food with a friend. I had two mini corn muffins and a few spoonfuls of avocado for dinner, by far my biggest meal of the day. But I am feeling even better today and I can tell that things are looking up: my appetite has returned. My stomach has been rumbling all afternoon, anxiously waiting to be put back into service. Who am I to say no? Time to cook. The golden beets are here mostly for their beautiful color as opposed to their flavor, but one could always add some more if desired. And omitting the livers shouldn't ruffle any feathers either. In a large saucepan, heat 1 tbsp butter and gently cook the grated beet. Just before the beets start to take on any color, add 2 qts. of water and bring to a boil. Season with a little salt. In another pan, heat remaining butter. Just before the butter begins to turn brown, add chopped liver and sage. Cook until just done and remove from heat. 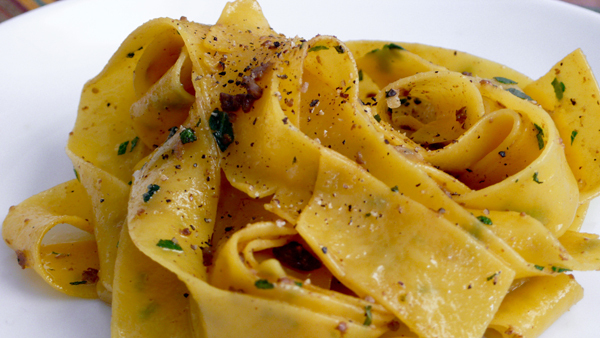 Add the pappardelle to boiling water and cook until just done. Remove the cooked noodles from the water and add to the butter/sage/liver mixture. Heat through, tossing constantly. Season with salt and pepper to taste. Serve.